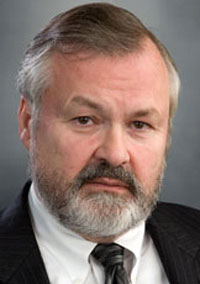 George Halvorson, chairman and CEO of Kaiser Permanente, Oakland, Calif., announced he will retire in December of 2013. Halvorson, who is 65 and has held the position since 2002, announced his intention to retire more than a year in advance to give the board of Kaiser Foundation Hospitals and Health Plan adequate time to find a successor, according to a Kaiser news release (PDF). Halvorson said in an interview that he expects his successor to join integrated provider Kaiser Permanente before he leaves to ease the transition. Although he says he had committed to just 10 years to the board when he joined the organization, he decided to stay another year given the changes taking place in healthcare, such as the setting up of insurance exchanges. “I think we're going to spend the next months defining the new world and in 2014 the new world starts,” he said. He said that once he leaves Kaiser he has no plans to take another job and will adopt as an avocation working on ways to reduce ethnic conflict, as sort of a continuation of Kaiser's efforts to improve workplace diversity. “That's an area I feel very strongly about,” he said. He also hopes to spend time with his five grandchildren, two of whom he hasn't seen in about six months, Halvorson said. Halvorson said that Kaiser's investment in health information technology is one of the highlights of his tenure, and he said the company and his successor will need to work to maintain a leadership role. “We're way ahead of the curve in terms of the connectivity agenda. We need to stay ahead,” he said. Halvorson said he expects to step down from most of the numerous national boards and committees he serves on. He currently serves on the Institute of Medicine Roundtable on Value & Science-Driven Health Care, the American Hospital Association's Advisory Committee on Health Reform, the Commonwealth Fund Commission on a High-Performance Health System, and the New America Foundation's Leadership Council, according to the release. He also sits on the boards of the National Committee for Quality Assurance, America's Health Insurance Plans, and the Alliance of Community Health Plans. Halvorson also was ranked No. 6 in Modern Healthcare' 2012 list of 100 Most Influential People in Healthcare.